A new World Land Trust exclusive Christmas card is now available to order. 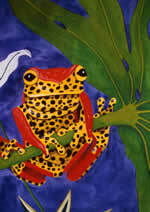 This year's card features a Poison dart frog by artist Oenone Hammersley. We will have the new Christmas card in stock in about 10 days but you can pre-order now, either online through the WLT shop (opens in new window) or by calling the WLT office on +44 (0)1986 874422. We also have a limited supply of Christmas card designs from previous years at new lower prices. Special offer prices apply if you order two packs or more of any card.